Graphics One, based in Sun Valley, California, is announcing the release of its new tabloid-sized GO ScreenMate Color Separation Printing System. This system is intended for imaging film positives for screenprinters. This is the first of a variety of new products from Graphics One for imaging film positives which will feature GO ScreenMate Ink with dMax 5 power. The new GO ScreenMate Color Separation System was developed to print professional film positives from the desktop. Modular in approach, the system is tailored to EPSON’s EcoTank line and is available with or without the printer, depending upon the user’s preference. The system includes ScreenMate Color Separation Ink, ScreenMate Color Separation Film and CADLink’s FilmMaker RIP. The CADLink RIP was developed for use with EPSON’s EcoTank printer line and offers InRIP separation with advanced workflow capabilities and patent-pending variable dot halftoning. The EPSON Expression Premium EcoTank ET-7750 is recommended for use with the system. “The ScreenMate system was developed to provide a robust desktop solution for screen printers. The key to the system is our ScreenMate Color Separation Ink which features dMax 5 power. This ink offers density approaching dMax 5 which is unheard of in our industry. Basically, a user has a high-end industrial system with desktop pricing.” stated Dan Barefoot, Vice President of Graphics One. 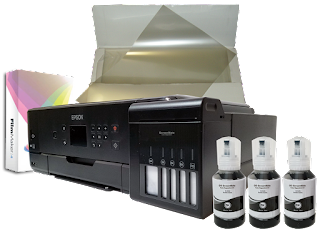 The system without the printer lists for $599 and includes CADLink RIP, ScreenMate Color Separation Ink and ScreenMate Color Separation Film. ScreenMate Ink lists for $19 for 140 ml bottles and is manufactured by Prism Inks. ScreenMate Film lists for $70 for 100 sheets in 11”x 17” size. Both the ink and the film are available in alternative sizes. The full system with the printer retails for $1,399. The ScreenMate System will commence shipping during August 2018 and will be available through the Graphics One distribution channel.